Group Discussions is an interview process or a group activity which is used as one of the best tools to select the prospective candidates in a comparative perspective. GD may be used by an interviewer at an organization, colleges or even at different types of management competitions. Candidates are given a topic or a situation, given a few minutes to think about the same, and then asked to discuss the topic among themselves for 15-20 minutes. Group Discussion is being extensively used along with personal interviews for the final selection of candidates. The evaluation of GD evaluation is done by the subject experts based on the discussions. Some of the personality traits which are being tested by companies and educational institutes include communication skills, interpersonal skills, leadership Skills, motivational skills, team Building Skills, reasoning ability, analytical /Logical Skills, reasoning ability, assertiveness among others. In a group discussion the participants must listen to the point of others after which they can put forward their points. 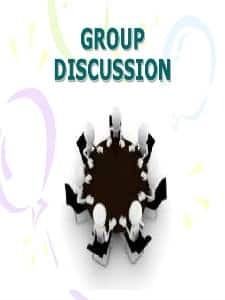 For those who participate in group discussions must have clarity of thoughts and should know about the current affairs. Candidates should give out valuable and relevant points that are catchy and short to the pointThere are many benefits of group discussion which helps the aspirants to put forward their best. It helps the candidates to shed away the shyness of a candidate and brings his viewpoint amidst all. It stimulates the candidates to think in a different, new way. In a group discussion proper analysis needs to be done. While participating in a group discussion it is important to put forward your arguments and points. It is beneficial in case the candidates can use quotes, facts and figures, statements to support their points. The group discussions are conducted for various courses such as MBA. UPSC also conducts Group discussions for recruitment purpose. Once the candidates clear the written exam of CAT, they will also need to clear group discussion. Since CAT is a commerce related course, the topics given to you will include usually about politics, our Indian economy, the current affairs, Law and order, education, business, rural and urban standard of living etc. In order to handle group discussions certain points need to be kept in mind like every candidate who would be present in the room having Group Discussion (GD) would want and try his/her best to stand out of the crowd. But being prompt, accurate and sensible is not everyone's quality. The most important thing to remember about GD is that you get 2-3 minutes on an average to think mentally mull over your answer. More or less like interview, here you would be addressing the group and there would be competition between candidates, to some extent. Once you are done thinking, make sure to write it down on a piece of paper, so as when you are speaking you would not only remember what you are saying but you can refer to it if in case you are missing out on something. Listen to other candidates' response carefully through that you can build up your unique opinion or response on the topic.It is advisable to not be the first person to speak up but do not take too long either. You should be the third or the fourth person speaking in the group. After voicing your opinion stay calm and let others speak, add more points to your argument and speak up again, later. Also you should try to conclude the argument in the end. In order to prepare candidates can practice by having group discussions. It is advisable to start reading current affairs and pick up topics to discuss. Candidates should never interrupt a person who is speaking in a group discussion. You should always let the other person speak. Another rule, you should look out at the tone when you speak. You should never raise your voice, even if you disagree with the person who is speaking in front of you, remember it is supposed to be a discussion. It would be considered bad by the evaluators if the tone is not correct and seemsFor the XLRI admissions, a candidate goes through before getting selected for XLRI PGDM Programme. The first stage is appearing for the XAT Exam conducted by XLRI. On clearing the required cutoffs a candidate is called for the Group Discussion and Personal Interview. Xavier Aptitude Test or XAT is a national level MBA entrance exam. conducted by XLRI Jamshedpur for the admission to post graduate management programmes at more than 150 B-schools in India. Some of the skills that are covered under group discussion are as follows:Communication skills make the first impression about the personality of the candidate. It is the responsibility of the speaker to ensure that what he/she intended to communicate has been communicated correctly and understood the way it was expected to be understood. Content is an important aspect of the evaluation process. Thus, you need to clearly display your understanding of all the issues pertaining to the topic. The more valid points you make, the more marks you score.The way you talk matters a lot. As long as you are able to convey your ideas in reasonably correct English, your fluency does not matter. Keep it simple while you are expressing your ideas. Dont think that Group Discussions are only about speaking. You have to make sure that you focus your attention on what other group members are saying instead of concentrating only on speaking.Your group behavior will matter a lot when it comes to group discussion as your behavior will be noted on the way you put your opinion, how you interact with the other members, how relevant you talk, and your body language and so on. Thus, actions such as shouting to gain attention and making snide remarks about others contributions will not do you any good at all. It is important never to target a single person and the person should always be directed to the group.Some of the topics which have already been given to candidates in GD round of XLRI to have discussion include Lokpal Bill will serve no purpose unless people are morally right, some people are born to stay poor, there is leadership crisis in India in religion, polity and society, we have dearth of entrepreneurs in India, population crisis in India, Is PM form of government (India) better than President form of government(US) and politics in India, Women boon to the society or bane to the society among others.